In September 1963, one of America’s most outstanding Hebrew-language weeklies, Hadoar, filled many pages with Jewish New Year greetings. Unlike several dozen other advertisers, the Greater New York Committee of State of Israel Bonds placed its notice in English: “Celebrate Rosh Hashanah by investing in State of Israel bonds and enjoy a happy New Year.” Presumably, the committee desired to reach more than just fluent Hebrew-speakers. They also supposed that some of those folks would also support Israel by investing in bonds. Israel, apparently, was very much on the minds of American Jews. 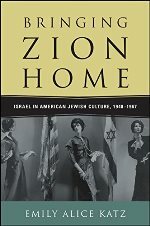 Emily Alice Katz’s Bringing Zion Home makes great use of this sort of evidence to prove American Jews’ interest in and devotion to Israel in the 1950s and 1960s. Katz’s monograph, then, is a corrective to the historiography that suggests that Jews in the United States did not pay too much attention to Israel until 1967 and the Six Day War (similar to Hasia Diner’s 2010 We Remember with Reverence and Love, which offers a parallel argument for Holocaust education and discussion). Recently, M. M. Silver’s work on Leon Uris’s Exodus argued that this novel triggered interest in Zionism among the American Jewish masses. Uris’s book was a best-seller in 1958 and was quickly made into a film two years later. This, though, is still too late a moment for Katz, who mined hundreds of periodicals and organization archives to show that the 1950s was the most formative decade for American Jewish support for the newly formed Jewish state. Katz’s slender monograph features a clearly articulated introductory chapter that outlines the above thesis and four chapters that detail four areas in which Israel advocates (both Israeli and American) attempted to draw Jews in the United States to the Zionist cause. These arenas include literature, folk dancing, consumption of made-in-Israel products, and “cultural production” such as art and music. These chapters are well developed and are scaffolded by relevant secondary literature. For instance, Katz’s knowledge of the “history of the book” scholarship helps present a balanced evaluation of Jewish fiction and nonfiction output in the 1950s. Accordingly, despite rave reviews of English-language books on Israel in a number of magazines, Katz reminds her readers that “the relationship between book, author, and audience is not always straightforward” (p. 43). Published by important publishers like Doubleday, authors—“celebrities,” according to Katz—wrote sympathetically about Israel, and their books were well known, but this did not always translate into high-volume sales. Still, that Israeli-style cookbooks, travel books, and fiction entered the American Jewish consciousness was crucial for the reception of later blockbusters like Uris’s Exodus. Similarly, Katz’s chapter on Israeli folkdance situates itself in the considerable history of Jewish youth movements, camping, and, most interestingly, American dance culture. The author convincingly demonstrates that proponents of Israeli dance gained much success by ensuring that their agenda cohered with American youth’s broader interest in multicultural dance. Katz’s two chapters on cultural consumption bolster the argument. Hadassah and like-minded organizations pushed American Jews to purchase Israeli products and acquire more high-end Judaica and art. Katz’s research into the archives of the American-Israel Cultural Foundation is particularly useful to prove her thesis. These agencies and governments insisted that Israel was an isolated “democratic” state in the Middle East in the prime of the Cold War; cultural consumption and patronage was therefore in line with America’s anticommunist efforts. Eisenstein’s remarks remind us that it was not just authors and Israel-sponsored institutions that moved American Jews closer to Zionism. It was also a grassroots effort, one that occurred on local levels. A good source for this is synagogue histories. This is crucially important, it seems to me, given the major synagogue boom in the postwar period. For instance, two slender, in-house volumes on Chicago’s well-heeled Conservative congregations spend several pages on the roles that their rabbis and lay leaders played in purchasing bonds and donating funds to the fledgling State of Israel. Other synagogue histories record important Israel moments. In 1950, an Orthodox congregation in Tulsa, Oklahma, weclomed “two Israeli freedom fighters who had actual combat experience during the Israel-Arab hostilities [in 1948]. Also, the sisterhood organized a skit entitled “Homeward Bound” to celebrate Israel independence. They were not the only ones who enjoyed the company of “heroic” visitors. A Reform congregation in Rochester, New York, welcomed a number of important guests. Temple B’rith Kodesh “during the 1950s and 1960s [invited] many prominent Israeli politicians ..., old friends like Golda Meir, and such acquaintances as Abba Eban and Moshe Dayan.” No doubt, the same might be learned through a thorough study of Jewish schools and other educational programs. In other words, American Jews did not just encounter Israel in literature, social dances, and artwork. All of this complemented a major effort among rabbis and lay leaders to ensure that their religious spaces offered ample room for Israel. Owing to this, Israel emerged as a religious cause among America’s growing number of synagogue-goers. No doubt, pro-Israel sermons and social programs in synagogues compelled Jews to invest their time and money in other Zionist enterprises, and vice versa. To be sure, Katz spends considerable pages in thoughtful analysis of the Zionist efforts of Adas Israel Congregation in Washington, DC, but there is room for more research on the ways that Judaism and Zionism contributed to one another in the post-1948 era. In any case, we owe much to Emily Alice Katz for a well-organized and sturdy monograph that renews a scholarly discussion and offers a welcome corrective to the field. Ira Eiesenstein, Reconstructing Judaism: An Autobiography (New York Reconstruction Press, 1986), 241. See The Anshe Emet Synagogue, 1873-1973 (Chicago: Anshe Emet, 1974); and Carole Krucoff, Rodfei Zedek: The First Hundred Years (Chicago: Congregation Rodfei Zedek, 1976). B’nai Emunah: Tulsa Oklahoma, 1916-1966 (Tulsa: B'nai Enumah, 1966), 74. Peter Eisenstadt, Affirming the Covenant: A History of Temple B'rith Kodesh, Rochester, New York, 1848-1998 (Syracuse: Syracuse University Press, 1999), 216. Zev Eleff is chief academic officer of the Hebrew Theological College in Chicago, Illinois, and author of Modern Orthodox Judaism: A Documentary History (Jewish Publication Society, 2016).